It's good news and bad news for Tribes: Ascend as the closed beta begins in a few weeks but the game itself is delayed until next year. 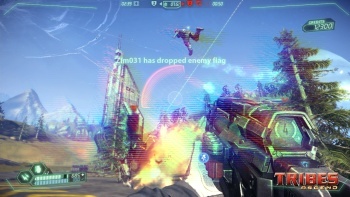 Tribes: Ascend is sort of an anti-Syndicate, in that the developers are taking a highly-regarded game from years long past, tuning it up for modern machines and then giving it to the world as-is and as-was. This is not a "reboot" or a "re-imagining," it's just more Tribes. The pending game has made a small, die-hard niche of fans very happy and here's something that will make them even happier: Hi-Rez Studios announced today that the closed beta will begin "within the next few weeks." Applications are being taken at at the Tribes: Ascend website and the studio says that thousands of gamers from around the world will eventually be selected for the task. For those who aren't familiar with it, Tribes: Ascend is the rebirth of the storied Tribes franchise as a free-to-play online shooter. The game was originally intended for both the PC and Xbox 360 but Hi-Rez announced in July that the 360 version had been shelved so it could focus solely on the. Players in the beta phase will have access to four multiplayer maps, two game modes, three vehicles and 12 playable classes in online battles of up to 32 players. The number of beta participants will be increased through the balance of the year. But with the good news comes the bad: the game was expected to be out later this year but has now been pushed back to an unspecified date in the first quarter of 2012.